Come See How We Grow! Agriberry Farm is not usually open to the public, however everyone is welcome on Farm Visit days. In addition, leashed pets (plus clean-up bags, due to food safety regulations) are also welcome to the farm. 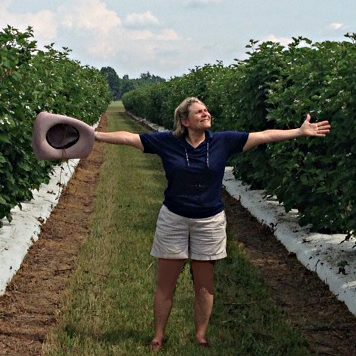 Each Farm Visit varies depending on the time of year, but you can expect to be able to walk the fields, talk with the Geyer family and some of our workers, stock up on farm goodies, and–conditions permitting–pick some great berries. Though not visible from the road, Agriberry Farm’s fields are located directly behind the parking area at the green-roofed, grey metal packing shed, which is adjacent to River Road. Accessing the fields involves a quarter-mile walk along a woodland path including some stairs and uneven footing. Orange cones will be placed to help guide you from the parking and barn area across Crump Creek and out to the fields. Not interested in visiting the fields or picking? Our Farm Visit days can be a great time to swing by the farm and stock up on what’s in season, and goodies from the farm kitchen. We’ll have a mini-market set up outside the barn with all your favorites! 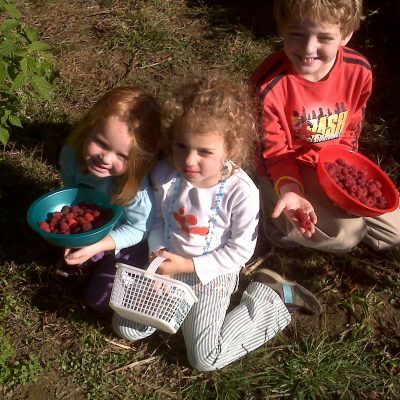 Join the Agriberry Farm-RVA mailing list, and you’ll never miss a Farm Visit! Visit the Historic Hanover Courthouse Area! After your visit to the farm, consider a visit to the Hanover Courthouse area, which is just a few minutes further north on Rt. 301 past the turn for River Road. This scenic area includes the Hanover Tavern, Hanover’s beautiful Colonial-era courthouse and original jail, and many other spots for fine and casual dining. If you’re still ready for more outdoor activity, the nearby Courthouse Park offers a nice walking trail and room to run. Parking for all Farm Visits is provided at Agriberry Farm’s “Woodberry Farm” site, unless otherwise noted. From Richmond/295: Take Rt 301 N approximately 10 miles to the intersection with River Rd. (Rt 605, which comes in from the right to form a “T” just north of Signal Hill Cemetery and south of Courthouse Park.) Turn right onto River Road and drive for approximately 1.8 miles to Agriberry Farm on the right. 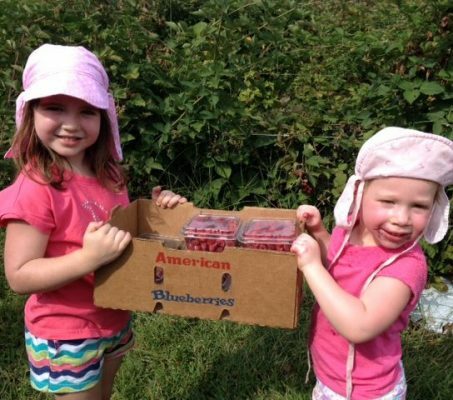 Please note that all visits are Rain or Shine events, and the opportunity to pick berries is subject to the discretion of the Geyer family depending on harvest conditions at all events. Watch our Facebook page for any last-minute updates. Want to grow your own berries and tree fruit? Effective pre-season pruning sets the stage for easier harvests, healthy growth and productive plants, and can help reduce the damage from disease and pests. You can learn from the Geyers, who have been growing fruit in Virginia for more than 30 years. The event is free and open to all. TIPS FOR YOUR SAFETY AND COMFORT! The Geyer family looks forward to your visit to Agriberry Farm, but hopes you’ll take a moment to review the notes below to ensure that everyone in your group is prepared for a safe visit. Toilet and hand washing facilities are limited to a single portable unit in the fields. In addition, there is a single bathroom available inside the barn by the parking area, but be sure to so factor in a little extra time in case there’s a line. Conditions in the field can be extreme, so please also double-check the weather forecast before you head out, with special thought to protection from the rain or sun, including loose fitting, light colored, long-sleeved clothing. Please BE SURE to bring at least one large water bottle per person. 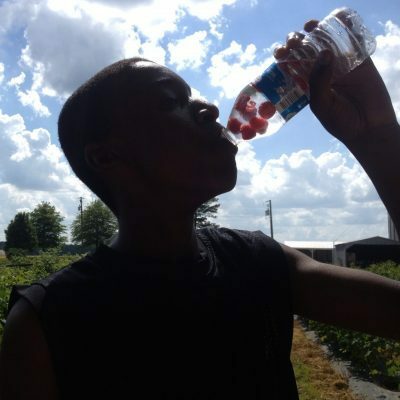 As our young workers can attest, picking is very thirsty work! Don’t forget the rain gear, depending on the forecast. Agriberry Farm is a working farm and footing can be tricky. Please move carefully and keep a sharp eye on the youngest members of your group. We recommend sturdy, field-ready, water-ready footware for everyone visiting the farm. The farm is home to many types of plants, insects (including bees and wasps) and other wild creatures. Contact with them is at your own risk. If you are highly sensitive or allergic, our fields might not be the best choice for you.